January 27, 2018 by Gary V.
I love how it creates accent on my living room. It's a perfect piece when you want an expression or something to dress up your plain room. Simple, yet classic and so intricate! July 27, 2017 by Rodrigo V.
This looks much better in person! I love how raw it looks and it perfectly fits my entryway. It's a good icebreaker / conversation starter when my visitor comes in the foyer. May 17, 2016 by Kaye F.
Love this table. Great quality and beautiful. 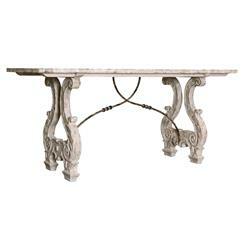 The ornate carving on this antiqued, whitewashed table lend it an authentic European look, while the sweeping metal detailing and graceful curves give it historical whimsy. Place this console in your urban loft’s entryway for a stunning first impression or use as a beautiful media center within your French country living room.